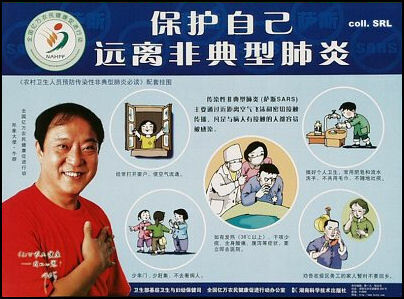 Chinese SARS poster SARS (severe acute respiratory syndrome) is a deadly pneumonia-like disease that appeared in China in 2002 and spread across China and into Southeast Asia and North America in the winter and spring of 2003, killing several hundred people, scaring many more and disrupting economies and travel plans around the globe. SARS was given its name by the World Health Organization (WHO) after it was first reported to the organization by an Italian doctor in Vietnam. SARS is caused by a corona virus, which is also connected to about a third of all cases of the common cold. The SARS corona virus is very deadly, killing almost 10 percent of the people who get it. About half of those who have died form it so far are over 65. 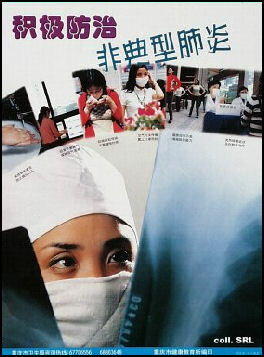 As of October 2004, 8,098 people had gotten SARS and 774 people had died from it. Higher death tolls had been listed. Investigation found some of the deaths on these lists were the result of other causes. China has been accused of covering up the SARS outbreak during its early stages. 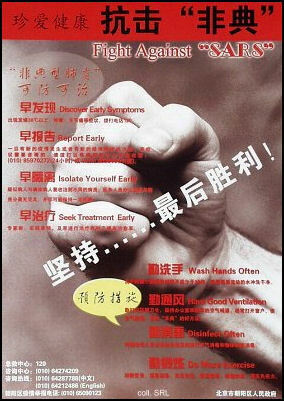 It is widely believed that if the Chinese authorities had been more aggressive fighting the disease, more forthcoming with information and had invited the World Health Organization to infected areas, SARS would more likely have been isolated and contained in its early stages before it was allowed it to spread. and hundreds of lives could have been saved. Links between Asian bats and the SARS virus have also been found. 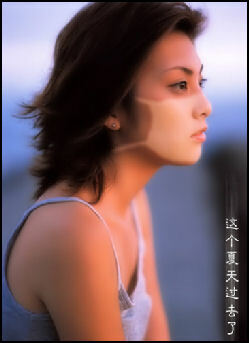 Effects of wearing a face mask SARS killed 349 people in China in 2002 and 2003. Around 5,500 people got the disease. Most of the cases were in Guangdong and Beijing with cases also reported in Shanghai, Shanxi, Inner Mongolia, Hunan, Sichuan, and Guangxi. News of SARS appeared in Hong Kong, Taiwan and Thailand before much news came out of China even though the disease originated in China. 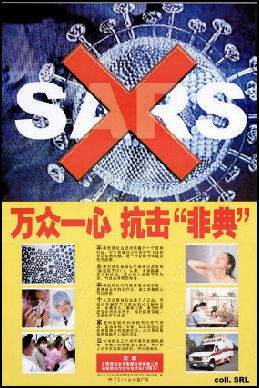 By the time the government finally released news about it SARS had spread all over China.